Before I get onto the really good stuff, as per my usual routine, I have a sappy speech for you! I'm sure many of you don't want to read anything and just want to get into entering, and that's fine. Just know that I thank you so much for your continuous support on my blog. I know I'm not the largest out there or even that popular, but to be where I am now is something I didn't think would happen a year ago. I'm sure most of us bloggers feel this way and this just sounds repetitive, but with every 100, 50, or even 10 new followers I get, I'm reminded of how far I've come and how happy I am doing what I do. I love getting such warm and reassuring comments from you guys. I know I've been slacking in replying and commenting back lately (I always try to answer questions, however) and I appreciate that you keep coming back and supporting me anyway! Without further ado, I thank you all so much. You are much more than just a number to me, you guys are reason I continue to blog. Thank you, thank you, thank you. Now get your entries in and I wish you the best of luck!! If you have any questions regarding the giveaway (or anything else), feel free to send me a message via my Contact Form! • Must be publicly following via GFC. • This giveaway is open to United States & Canada shipping addresses only. If you're an international reader, you can enter and win if you have someone in the US or Canada who I can ship the prize to. EDIT: If you're willing to chip in for the shipping cost, an arrangement could be made to ship internationally. 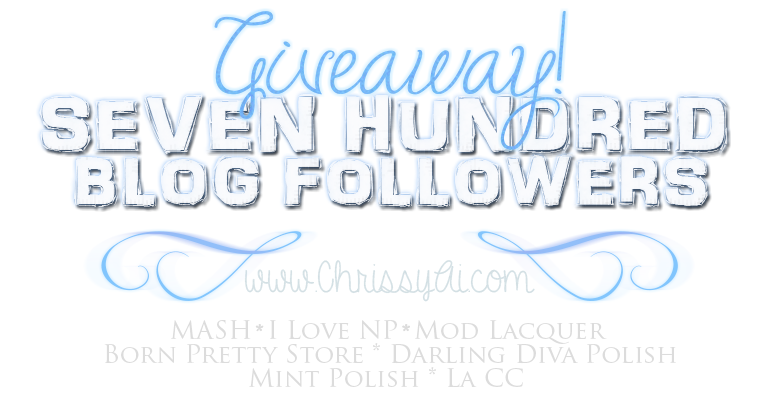 • This giveaway begins June 25th, 2013 and ends on July 26th, 2013. • La Couleur Couture "1957", "1960", "1963", "1977", and "1992". • I Love Nail Polish "A Touch of Mint", "Babes in Toyland", "Grande Sunset", "Princess Diaries", "Pixie Dust". • Darling Diva Polish "Lucky Star", "Material Girl", and "Love Don't Live Here Anymore". • Mod Lacquer "Kosmik Karma" & minis "Star Seeds", "8-Bit Digits", and "Nonpareils". • Mint Polish "Ming", "Esmeralda", and "Original Mint". For a closer look at the prizes, check here! BY ENTERING THIS GIVEAWAY YOU ARE AGREEING TO NOT RESELL THE PRODUCTS. DONATIONS AND GIVEAWAYS EXCLUDED. *The prizes in this giveaway have been generously sponsored by the companies listed. Be sure to drop by their pages and give a big thank you for their generosity! Prize pack #2 looks awesome! Thanks for the opportunity! either one! congrats on 700! Oh my word, congrats! You deserve it. I'd be thrilled to win either prize pack, but those LACCs and ILNPs are screaming my name! I've love #1 (but really both are amazing)! Congrats on 700 followers! I would prefer prize pack 1 if I won. There is no spot to put an e-mail address to contact the winner, so how will you contact them? Through Facebook? I would love the 25 piece stamping plates. :) Thanks for a chance at an awesome giveaway! Thank you so much for the opportunity! I would love either, but prize 2 is my favorite! Congratulations on 700 followers!! Thank you for the chance to win . I realy would be grateful for either prize! Congratulations on 700!!! Thank you for such a great giveaway!!! I would like #2! Congratulations!!!! You totally deserve more! I would love prize pack 1! Great blog. Great giveaway. Would love prize pack 2. I can never have enough stamping plates or brushes. Those polishes are gorgeous as well! Congrats! congratutulation on 700 followers woo woo! I remember when we first "met" and how foreign this whole blogging thing was! This is such a huge milestone girl! And what a great giveaway that I can enter yayyy!!! Congratulations my love!! ooh, and I would LOVE to win Prize pack 1! Either prize would be awesome, but if I had to choose I would go with number 1. Congrats on 700, and thank you for this awesome giveaway. Good luck everyone!! Congratulations! I would be happy to win either prize! #1 and congrats on 700!! Congrats on 700! I would be blessed to win either, but I've been wanting to get into stamping, so #2 would be my preference. Best wishes! Congrats!! I really like them both so I'd be ok with either one!!! I'd love to win the 1st prize, but #2 is wonderful too! Congrats on 700! You deserve it! I lust all ILNP but haven't gotten my hands on any yet so that's the prize pack I'd choose (#1!). Also like someone else mentioned the contact info option doesn't actually let us type anything in it. Congratulations on 700! I know how exciting it is to watch your audience grow- even if it's 10 more followers. And what an amazing giveaway! <3 Love it! I'd love either one, but prize 1 has the edge. Congrats on the milestone and thanks for the giveaway! Thank you for the giveaway and congrats on 700! If I were lucky enough to win I'd love the first pack. Prize pack #2 :) Congrats! Prize #1 would be awesome. But question, there is a spot requiring you to put your email address . . there is no spot to be filled out, it is okay since I already signed in using my email address?? I love either, but Prize #1 is definitely my first pick! my email: amykstarke [at] hotmail [dot] com.... thanks for the chance! I really like #2! I love #1 too, but if I had to choose I'd go with #2. email- dlwimberley@gmail.com CONGRATS on 700!!! #1 & Thanks for the giveaway! I hope I win - they both are great, but prob #2 bc I really want to try stamping! Oh my gosh what a difficult choice!! Love BOTH but I would choose #1! Thank you for the opportunity! WOW!! First off, massive congrats on the 700 followers!! I hope to be so lucky with mine! Second, omg, what a great giveaway and i would be over the moon and completely chuffed if i won Pack 1!! Just drooling just looking at them!! Just found you and new follower, but love what ive pottered around looking at! I would love pack #1!! Ooooh, gonna say Prize Pack 2! All the MASH!!!! Congrats Chrissy!!! I would love prize pack #2! It's amazing! Oh this is hard to pick between the two but I think I would go with Prize Package #1 as I have been wanting to try the La Couleur Couture polishes. Congrats on your 700 followers! Thanks for the giveaway! Thank you sooo much for this fantastic giveaway and congrats on the 700 followers!! I'd love to win prize #1 but I' d be extremely lucky to get either one of them! I would honestly be thrilled to win either prize, but if I have to pick one, I'd go with #1. In any case, congrats on your milestone and thanks for the chance to win! Been a nail polish lover for a year, now, but only recently started checking out other nail polish lovers in social media. 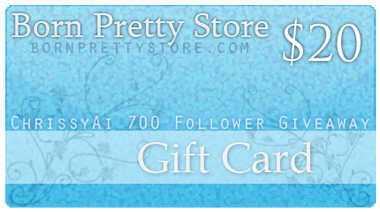 Greta from Mint Polish tipped me off to your 700th follower celebration and giveaway. Congrats! Having just discovered and fallen in love with Mint Polish, I'd have to say Prize Pack #2 is my preferred! I think that I would choose prize pack #2 because I really want to get more into stamping than I already am...so that would be a great prize for me!!!! Thanks for hosting the giveaway AND congrats for reaching 700 followers on facebook! I would love to win the prize pack two because I would like to get into stamping and I don't have any plates... Congratulations for reaching the 700 followers!! I think I would choose prize pack #1! I would love prize pack 1 !! Thanks for this giveaway - it's awesome! thank you so much for this giveaway! while I would be happy w/anything, if i had to choose, it would be prize pack 1 - again, many thanks! I love both packs- but I would love #1 even more! Congratulations and I am excited to be a new follower!!! I would love to have either of course, but I think prize one looks like the winner to me! Congrats on 700! I would be thrilled to get either, but if I got to choose, I would pick 1! congratulations! Thank you so much for the opportunity to win and awesome giveaway! Congratulations on 700! If I win I would love prize #2! Great giveaway. It's so hard to decide, but I'm going with prize #2. What a thoughtful and amazing giveaway! I would LOVE prize pack #1!! I had to go through and do the giveaway again with my new FB name/link! I would like number but they are both almost!! Thank you for the giveaway!! Congratulations on 700 Subscribers! I really love prize pack 1 and thank you so much for having the giveaway! Thank you for this awesome giveaway! And if I won first I would love prize pack 2! #1! Congrats on 700 followers! Prize Pack 2, but Prize Pack 1 is awesome, too!! I would be happy with either :D Congratulations on 700 followers! I'd prefer prize pack #2, but they are both amazing!!!!!!!!!! I"m SO thrilled to have the chance to win one of these amazing prize packs!!! One of the best giveaways I've EVER entered!! Good luck to everyone!! Thanks ChrissyAi!! Much Love! Congratulations! And I would LOVE prize pack #1! Congrats on 700 followers! I would love the "I LOVE NAIL POLISH" portion of the giveaway..but any of them would be awesome! Thank you for having such a great giveaway!!! I would love prize pack#2 so I could have some real plates....Thanks for the opportunity! Also congrats!!!! But if i REALLY have too, i think maybe pack 1. Good luck on your giveaway! I think I'd love to go with prize pack #1 if I win. Both look amazing, though! Good luck everyone. Prize #2 Thanks and Congrats!!! I really like both but I think I like #2 just a little more because of all the stamping goodies. Congrats! Love the Mash goodies in prize pack #2! Congratulations!!!!!!!!!!!!!!!!!!!!!!!!!!!!!!!! Prize pack 2 would be awesome! Prize #1. I love all nail art and polishes. The first one, for sure! Both of these are phenomenal prizes! I think #1 would be my preference, if only slightly, because I've been wanting to try I<3NP. Thank you for this amazing giveaway! I would love to win #1! I'd prefer prize pack #1 but they are both really awesome! I'd love to win #2, thank you for the opportunity. I think I am addicted to polish! I'd love prize pack 1!! Prize pack two looks fantastic with those stamping plates! Thanks for holding the contest! Prize Pack #1! Thanks for the giveaway and congratulations on 700 Followers! It has more polish, even though I don`t have an Iphone, I`d still prefer it to the other, though they both look good. Both prizes are amazing, and I would love either... but if I had to choose, it would be #1! Thanks! I would choose Prize Pack #1! Thanks for the opportunity! Amazing Giveaway! The iPhone case in Prize Pack #1 is amazing, but I have REALLY been wanting the Mint nail polishes ... I would probably pick #2, but be absolutely THRILLED with either one! Both are amazing, but I would have to say prize pack #1 wins for me! Either one would be great!!! I'd like Prize #1. Congratulations on your 700 followers! I love both your nail polish and make up posts! Hi Chrissy, I would love Pack #2. Thanks!! If I won, I think I would pick prize pack #1. Thank you! If I won, I would choose #1! Thanks for the chance! If I won, I would chose Prize Pack #1! I would chose Prize Pack #1! If I was lucky enough to win (fingers crossed) I'd love to win prize pack #1. I've been wanting to try ILNP and Darling Diva. Congrats on the big milestone and it's incredibly generous of the sponsors to sponsor the prizes that they did! Wow!!! This is an INSANE giveaway!!! Thank you guys so much! I would want the 1st pack. Both are pretty uh-may-zinguh! Either one! I would be happy with both too. I would love to win Prize 1 from the giveaway! Thank you so much!